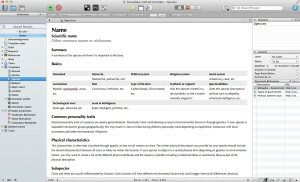 5 new Scrivener template sheets for your enjoyment. I might have previously mentioned that I love templates, and you might ask why. I love them because they make world-building easier, not in a ‘this is how things must be done’ way, but in a ‘here’s some questions to get you started’ way. Sometimes, when I’m in the thick of creating a story, or the world it’s going to be set in, I have an idea for a something (generally a plant, animal, person or thing). This something often plays an important role in my developing plot (or world), and while I may know a few details, such as its name and function, the nitty-gritty can elude me. The last thing I want to do when I’m in full plot- or world-developing flight is get sidetracked by the nitty-gritty. I’d rather spend the brainpower describing the new world, species or thingy-ma-bob, than racking my brain (and the Internet) for the first question I should be asking myself (such as, is this planet habitable?). Which is where templates come in. For me, templates are questionnaires that take all of the hard, boring work out of plot-development and world-building, and leave the hard, fun work behind. Creating them is also a fantastic procrastination tool. For your convenience (and my procrastination) below are some more world-building goodies. If you missed the previous set, you can find them here. These worksheets, from Michael James Liljenberg at Elfwood, are well worth checking out. Sorry for not replying sooner. 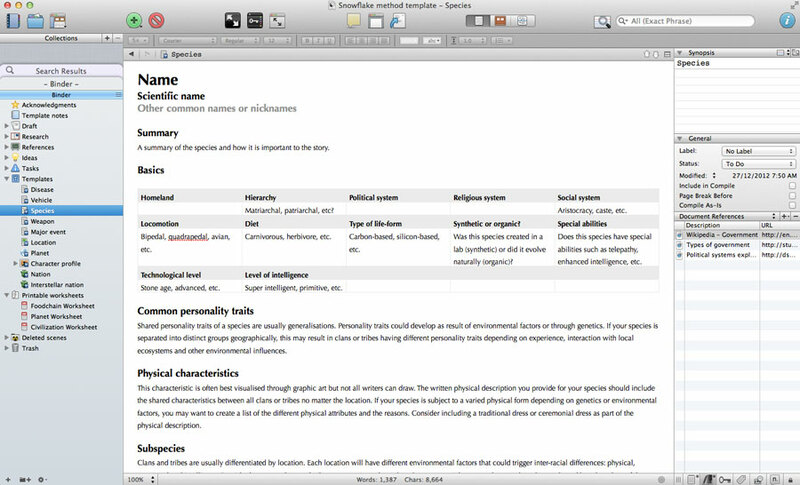 I have just downloaded the template and tested it with my version of Scrivener (Mac v2.5) and had no problems. If you haven’t resolved the issue already, I can try to help you via email. Alternatively, you can always check out this post about importing templates into Scrivener.